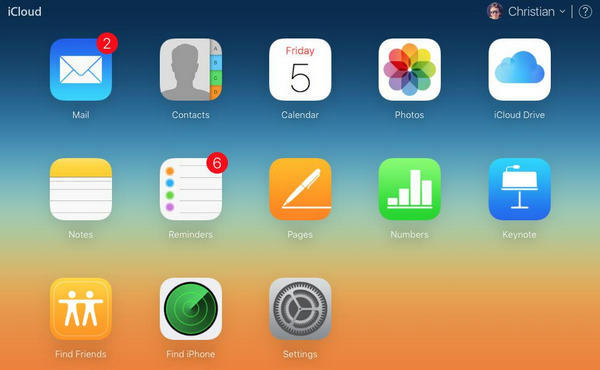 It's known to us all that iCloud is commonly applied by iPhone/iPad/iPod touch users to back up important data. Except for that, it also comes in handy to protect your privacy with special encryption system. Despite its convenience, apple users still face some unresolved confusion. Definitely, there is no way to access and view iCloud backup whenever necessary. Therefore, just like Robert, more users are wondering how to download iCloud backup to PC. 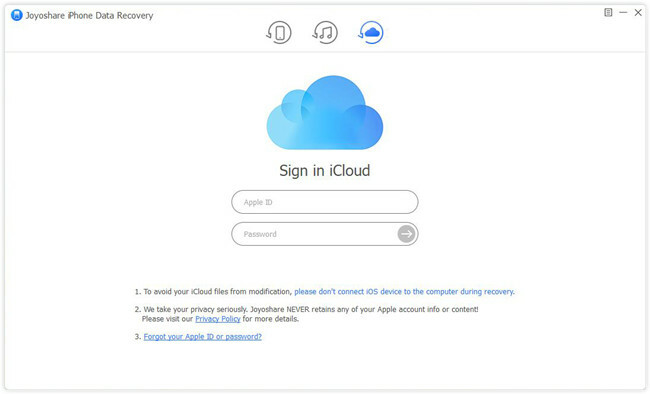 To fix it, we will tell you step-by-step guide on downloading backups by using iCloud.com, iCloud drive and iCloud backup extractor as follows. Any iOS (iPhone/iPad/iPod touch) file that you have previously backed up to iCloud can be downloaded readily, for instance, contacts, calendar, photos, notes, reminders, etc. However, iCloud only give you a hand to keep them for 30 days, after which all synced data will be removed. Next we will show you how to download iCloud backup to PC free. Step 4: Set storage path to save downloaded iCloud backup photos. Step 4: Download whatever you choose and go to This PC > iCloud Photos/Notes/Ringtone/Calendar folder to check them. If you really want to escape the limitations of aforementioned methods, such as only access partial iOS data, have no right to preview files before recovery, use just 5GB free storage, etc., you might turn to Joyoshare iCloud Backup Extractor for help. 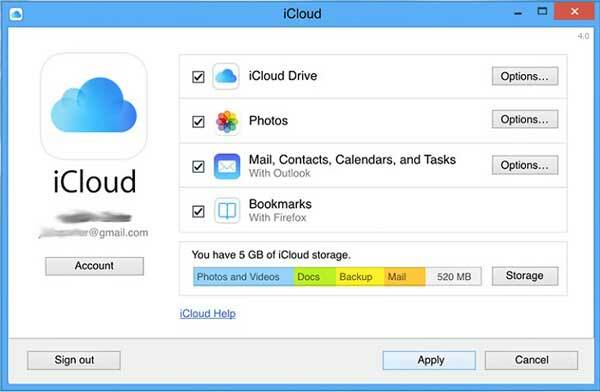 This utility is devoted to downloading any of your created iCloud backup without device on PC. Explicitly, you are authorized to download more than 20 kinds of iOS files, like photos, videos, calendars, call history, voice memos, Safari bookmarks, iMessages, videos, app data, etc. without problem. It also comes with broad compatibility to work well for the latest iOS 12 and a series of iDevice models, including iPhone XS/Max/XR, etc. Best of all, it's available to preview items you want at discretion and choose data selectively without overwriting and damaging current files. 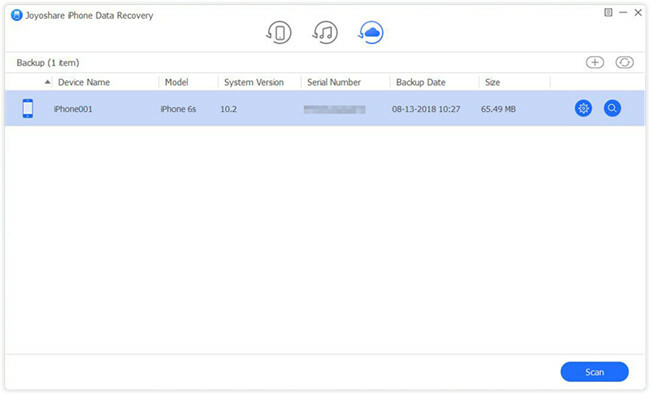 Launch Joyoshare iPhone Data Recovery and sign in iCloud account with Apple ID and password under "Recover from iCloud" recovery mode. The one who opens "Two-Factor Authentication" on iDevice settings should additionally type in random code to finish login. Relax. No records will be taken by Joyoshare. 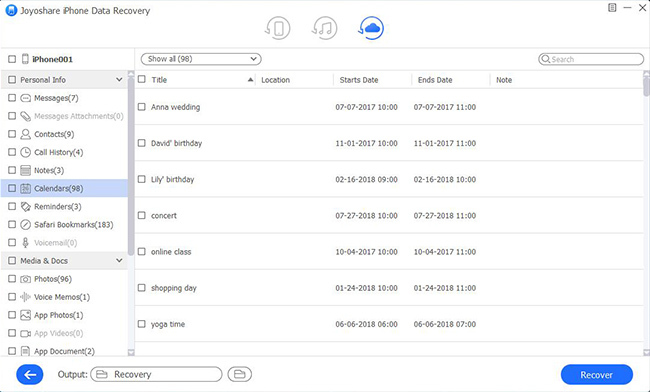 Joyoshare will display all your iCloud backups orderly. According to the device name, system version, backup data, file size, etc., pick up the most relevant one and tap on the "Download" button near to it. You can wait until the entire iCloud backup has been downloaded or stop downloading in the progress. Then hit the "Setting" icon to select needed data types and simply click "Scan". Once the scanning ends, look through results in the way you like. You can directly check the whole category you need or only mark designated items. Then just download and save them to your own PC with the aid of "Recover" button at the right bottom.